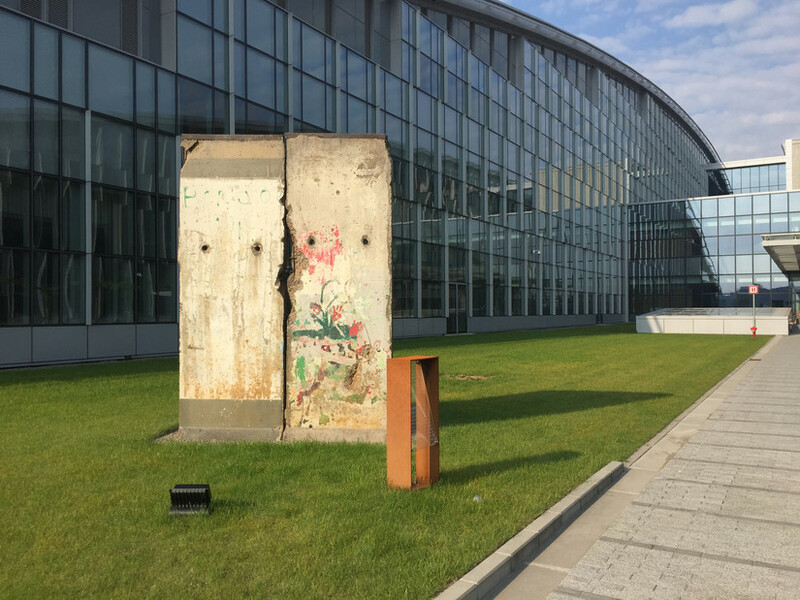 Berlin Wall remnant outside NATO'S Brussels headquarters. Huge reverence for NATO is matched by how dangerous NATO has become. NATO's continual expansion all the way to Russia's borders has significantly increased the chances that the world's two nuclear superpowers will get into direct military conflict. Two years ago, when the Senate debated whether to approve bringing Montenegro into NATO, the mud flew at Sen. Rand Paul of Kentucky after he showed up to object. An infuriated Sen. John McCain declared on the Senate floor: "I have no idea why anyone would object to this, except that I will say if they object, they are now carrying out the desires and ambitions of Vladimir Putin, and I do not say that lightly." Moments later, when Paul said "I object," McCain proclaimed: "The senator from Kentucky is now working for Vladimir Putin." Ever since the fall of the Berlin Wall and the quickly broken promises by the U.S. in 1990 that NATO would move "not one inch eastward." NATO has been closing in on Russia's borders while bringing one nation after another into full military membership. During the last three decades, NATO has added 13 countries and it's not done yet. Lobbying is only part of what's needed. As NATO marks its 70th anniversary next week with a range of activities, including a White House welcome for Stoltenberg on Tuesday, his speech to Congress the next day and an official "celebration" on April 4 counter-actions including forums and protests as part of a "No to NATO" week will be happening in Washington. "NATO and a just, peaceful and sustainable world are incompatible." It is an unjust, undemocratic, violent and aggressive alliance trying to shape the world for the benefit of a few." There are many villains here. The first major one is GHW Bush, who lied about NATO expansion, and his successors who continued his policies. The second is Putin, who is in some ways allied with POTUS, in that they use imperial expansion and pride, without regard to cost in target countries, to solidify their grasp on domestic power. In my opinion, Russia is not expanding imperially, nor is it acting (in defending Syria and to some extent Venezuela) out of "pride", more out of a need for survival and defending its right to associate freely with other sovereign states. As far as not acting with regard to cost in those two countries, it is at least acting in cooperation with their governments. Russia invaded Ukraine in multiple places, including Crimea overtly, and eastern Ukraine (where it pretends not to have invaded, but the insurgents have heavy weapons from Russia and those insurgents are mostly not trained to operate those weapons). Russia also seized the formerly international waters the Strait of Kerch, despite the risk that in doing so it has given permission for Turkey to close off the passage from the Black Sea and the Med, at least for Russian ships. I do believe that Russia's actions in Syria and Venezuela are invited, legal, and protective.